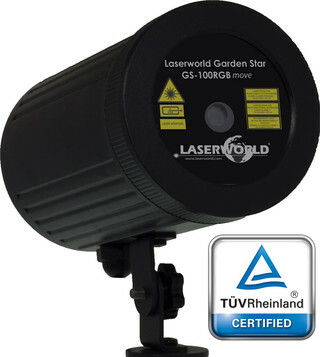 The GARDEN STAR RGB – Laserworld GS-100RGB move is a red-green-blue laser light effect for outdoor as well as indoor applications. Several hundreds of fine, clearly visible red, green & blue laser dots illuminate plants, trees and facades of buildings at a large scan angle. This laser effect also draws attention at every party, e.g. at Halloween, Christmas, etc. The GARDEN STAR RGB comes in a durable and waterproof aluminium housing (IP65). Thus it&apos;s particularly suitable for effective lighting in gardens, at ponds, pools, on balconies and outdoor areas.